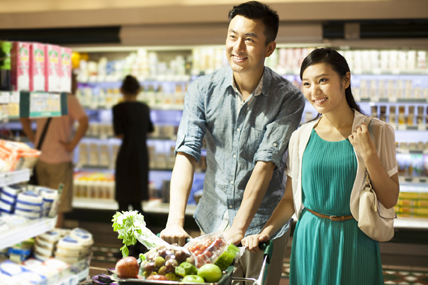 Kantar Worldpanel’s latest figures 12 weeks ending 6th Nov 2015 in China shows the growth of total FMCG market continues deceleration as it only grew by 2.0%, a much lower rate than last few months. West region is leading the growth with 3.6% growth rate while East, South and North are behind total average, grew by 1.7%, 1.4%, and 1.8% respectively. Sun Art group has maintained outstanding momentum of growth since last few months. The retail group’s double-digit growth rate (16%) in spending has secured the leading position with 7.6% of the market share nationally, up 0.9% from the last period. In East and North, the retailer continues to enjoy being leader with market share of 15.4% and 6.1% respectively. Notably, the retailer’s continuous efforts and investments in attracting new shoppers has paid off as penetration exhibited sharp growth in South and West region. As a result, the group’s market share saw substantial uplift, reaching 1.9% in West and 4.5% in South. Regional retailers are continuing to build share. In East, Dennis’s strong performance has helped the retailer to add 0.3% market share from a year ago, taking 1.5% share of the region. In South, Vanguard group keeps reviving in its stronghold, growing market share to 5.8% up 0.6% from the same period last year. In West, Beijing Hua Lian and Bubugao are becoming stronger challengers in the region, both gaining market share to 2.1% and 1.4%. In North, Li Qun group has remained aggressive growth since last few months, driven by more shoppers as penetration grew by 13.1%, which helped the retailer to gain 1.7% of the market.